The last time I talked to my mom on the phone she told me I should be starting to think about retirement. She told me I should be thinking about my future. I was thinking about where I was gonna get the $150 I needed for my insurance premium and still eat. 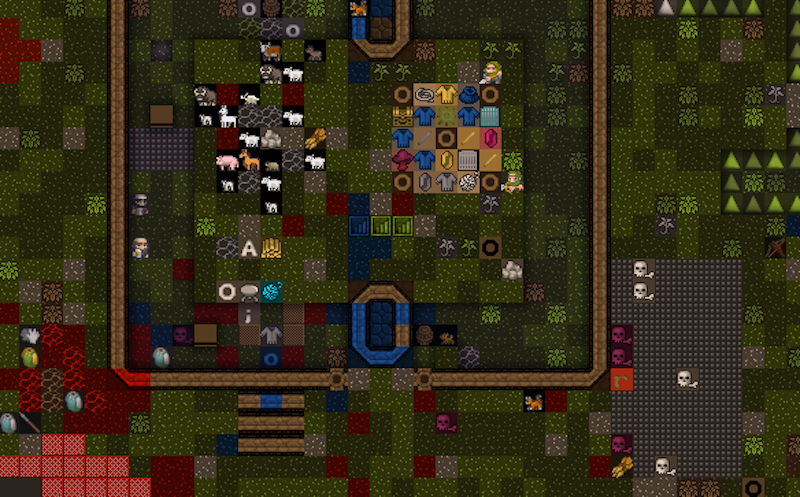 After I hung up with my mom, I played Dwarf Fortress until 6 am. I mean, she’s right, as she so frustratingly insists on being. I’ve entered the latter half of my 20s, and I should really start thinking about where I’m going with all this. But it’s hard not to laugh when I’m also trying to figure out how to get an Illinois LINK card for food stamps.. As with most of my friends—mostly young, passionate artist types or people who have gone back to school—I’m struggling financially, even with the help that I get from my parents. I don’t really make plans for myself for more than a week in the future. Who knows where I’m gonna be by then? These days, we’re all sinking slowly into a dystopic intermediate. I’m a Millennial with Boomer parents and while they’re both old hippies, it’s still hard to explain the reality how I have to live. Jobs—real jobs that turn into careers, not retail or service industry jobs, I mean—are scarce. The field in which I’ve hunkered down, writing professionally, is venturing into a wild west of discovery and terror as we all try to figure out how journalism survives in the age of the internet. I exist in a series of liminal states, bouncing from one in between to another. And it’s not different for anyone else I know. We are all such busy people, but what are the “somethings” we can say we’ve done? The past year was really big for me. I’m working on a game I’m excited about. I get offered an editorial job about once every two weeks. There’s a book, a physical book, with my writing in it. I’m still having a hard time with the future. I’m having a hard time with the idea of legacy. Sometimes I think about all the obstacles, particularly the financial ones, between me and being able to have children. I get into a dark mood that lasts for hours. I don’t know if I’m going to have something that lasts in my life. People my age keep moving. My group of friends is a kind of wavering circle, as people pack up from Chicago to New York and Los Angeles, hoping for better opportunities. I’ve moved each of the past three years. Again, not very different from my friends. We avoid accumulating things. We don’t want to deal with them when we change apartments. My dad bought me an incredible blender—it has a bullet attachment and a food processor—and when I first saw it, what I thought was, “Should I keep all the cardboard for when I move?” The box is still in my kitchen. When I moved from my last apartment to the one I live in now, I left my couch in the alleyway. It was too heavy, and besides, like everything else I own it was a piece of junk. If you end up moving in The Sims, it’s because you want to, not because the rent got too high, or your landlord won’t renew your lease, or because you can’t find a job. You are not tasked with updating your addresses on your Amazon.com account once a year. You have a space, a space that is consistent. You have what is commonly referred to as a home. I usually use the cheat “motherlode” to get enough money to build a giant house that will last for generations, and then keep building and building on it, until I have the most expensive and lush furniture in every room. Even when I play the way The Sims wants me to, I know that all my sims will have steady jobs and most likely earn enough money to remodel their kitchens or have children or buy a car. In The Sims, you aren’t going to be running from odd job to odd job. You don’t go back to school because it’s less depressing than being unemployed. In The Sims it isn’t prohibitively expensive to raise kids. If you’re a writer in The Sims, you won’t be forced to choose between your passion and your family. Games are often about fantasy, and nothing seems more fantastical than a stable life. We often talk about wish fulfilment in this space, but usually in a grander way. We talk about wish fulfilment as being the savior of humanity, or being able to shoot a lot of bad guys. There’s a YouTube video I show people sometimes when I try to explain why I find those conversations a little boring or tedious. A young man made it. He’s being very earnest when he says that he prefers games to reality, that in games he can be anything. The original video has been deleted, and the only one that exists on YouTube now was re-uploaded to mock him. Yes, it is a little funny when this young man says that he prefers Mass Effect to the idea of going to college so he can end up in a dead end job. The problem is that he is a little bit right. In games, you can be anything, and increasingly they are spaces where you can make anything. Even if you have supposedly done nothing in your life, you can point to your home base in Minecraft and say, “I made that.” You can point to your tricked-out, modded Sims game where everyone looks like they’re Instagram-famous and say, “I made that, and here’s their story.” I promised my friend I’d tell her the story of my Dwarf Fortress game when everyone inevitably died. Here’s what happened: I accidentally mined into an aquifer and everyone drowned, but before that I had a thriving economy making porcelain crafts encrusted with opals and quartz. Udidkeshak became a barony of the larger kingdom, and Shorast Abelgugash was made baron. We had been trying to build a well when, suddenly, my dormitories flooded. We lasted a few more years until everything else flooded, too. The fortress is still there. Even if everyone’s dead, the fortress will last. It’s easy to get lulled into a sense of satisfaction in games. In many ways, making you feel good and accomplished is their goal. But it isn’t real. Even if my fantasy is banal, it is a fantasy like any other. I’m of two minds about it. It feels like I am wasting my time. Maybe my parents are right, as they frustratingly insist on being. Maybe I am just coasting through my twenties, avoiding getting serious. Then again, maybe I need to indulge the fantasy of stability every once in awhile. Like so many of my peers, I need something to stop myself from drowning in the uncertainty of my reality.